On June 17, Vice Chancellor Franz von Papen, who had helped Hitler become Chancellor, stunned everyone by making a speech criticizing the rowdy, anti-intellectual behavior of the SA and denouncing Nazi excesses such as strict press censorship. 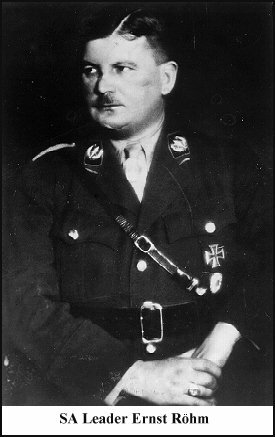 Papen also focused on the possibility of a 'second revolution' by Röhm and the SA and urged Hitler to put a stop to it. "Have we experienced an anti-Marxist revolution in order to put through a Marxist program?" Papen asked. His speech drastically increased the tension between German Army leaders and SA leaders and further jeopardized Hitler's position. But for the moment Hitler hesitated to move against his old comrade Röhm. On Thursday, June 28, Hitler, Göring, and Goebbels attended the wedding of Gauleiter Josef Terboven in Essen. Hitler was informed by phone that he faced the possibility of a putsch by Röhm's forces and also faced the possibility of a revolt by influential conservative non-Nazis who wanted Hindenburg to declare martial law and throw out Hitler and his government. Hitler then sent Göring back to Berlin to get ready to put down the SA and conservative government leaders there. The SS was put on full alert. Friday, June 29, Hitler made a scheduled inspection tour of a labor service camp and then went to a hotel near Bonn for the night. He was informed by Himmler that evening by phone that SA troops in Munich knew about the coming action and had taken to the streets. Hitler decided to fly to Munich to put down the SA rebellion and confront Röhm and top SA leaders who were gathered at the resort town of Bad Wiessee near Munich. Arriving in Munich near dawn, Saturday, June 30, Hitler first ordered the arrest of the SA men who were inside Munich Nazi headquarters, then proceeded to the Ministry of the Interior building where he confronted the top SA man in Munich after his arrest, even tearing off his insignia in a fit of hysteria. Next it was on to Röhm. A column of troops and cars containing Hitler, Rudolf Hess, and others, sped off toward Röhm and his men. At this point, the story is often told (partly conceived by the Nazis) of Hitler arriving at the resort hotel about 6:30 a.m. and rushing inside with a pistol to arrest Röhm and other SA leaders. However it is more likely the hotel was first secured by the SS before Hitler went near it. Hitler then confronted Röhm and the others and sent them to Stadelheim prison outside Munich to be later shot by the SS. An exception was made in the case of Edmund Heines, an SA leader who had been found in bed with a young man. When told of this, Hitler ordered his immediate execution at the hotel. A number of the SA leaders, including Röhm, were homosexuals. Prior to the purge, Hitler for the most part ignored their behavior because of their usefulness to him during his rise to power. However, their usefulness and Hitler's tolerance had now come to an end. Later, their homosexual conduct would be partly used as an excuse for the murders. Saturday morning about 10 a.m. a phone call was placed from Hitler in Munich to Göring in Berlin with the prearranged code word 'Kolibri' (hummingbird) that unleashed a wave of murderous violence in Berlin and over 20 other cities. SS execution squads along with Göring's private police force roared through the streets hunting down SA leaders and anyone on the prepared list of political enemies (known as the Reich List of Unwanted Persons). Included on the list: Gustav von Kahr, who had opposed Hitler during the Beer Hall Putsch of 1923 - found hacked to death in a swamp near Dachau; Father Bernhard Stempfle, who had taken some of the dictation for Hitler's book Mein Kampf and knew too much about Hitler - shot and killed; Kurt von Schleicher, former Chancellor of Germany and master of political intrigue, who had helped topple democracy in Germany and put Hitler in power - shot and killed along with his wife; Gregor Strasser, one of the original members of the Nazi Party and formerly next in importance to Hitler; Berlin SA leader Karl Ernst, who was involved in torching the Reichstag building in February, 1933; Vice-Chancellor Papen's press secretary; Catholic leader Dr. Erich Klausener. Saturday evening, Hitler flew back to Berlin and was met at the airport by Himmler and Göring in a scene later described by Hans Gisevius, a Gestapo official, present. "On his way to the fleet of cars, which stood several hundred yards away, Hitler stopped to converse with Göring and Himmler. Apparently he could not wait a few minutes until he reached the Chancellery�From one of his pockets Himmler took out a long, tattered list. Hitler read it through, while Göring and Himmler whispered incessantly into his ear. We could see Hitler's finger moving slowly down the sheet of paper. Now and then it paused for a moment at one of the names. At such times the two conspirators whispered even more excitedly. Suddenly Hitler tossed his head. There was so much violent emotion, so much anger in the gesture, that everybody noticed it�Finally they moved on, Hitler in the lead, followed by Göring and Himmler. Hitler was still walking with the same sluggish tread. By contrast, the two blood drenched scoundrels at his side seemed all the more lively�"
As for Ernst Röhm - on Hitler's order he had been given a pistol containing a single bullet to commit suicide, but refused to do it, saying "If I am to be killed let Adolf do it himself." Two SS officers, one of whom was Theodore Eicke, commander of the Totenkopf (Death's Head) guards at Dachau, entered Röhm's cell after waiting fifteen minutes and shot him point blank. Reportedly, Röhm's last words were "Mein Führer, mein Führer!" On Sunday evening, July 1, while some of the shooting was still going on, Hitler gave a tea party in the garden of the Chancellery for cabinet members and their families to give the appearance things were getting back to normal. By 4 a.m., Monday, July 2, the bloody purge had ended. The exact number of murders is unknown since all Gestapo documents relating to the purge were destroyed. Estimates vary widely from 200 or 250, to as high as 1,000 or more. Less than half of those murdered were actually SA officers. In one case, a man named Willi Schmidt was at home playing the cello. Four SS men rang the doorbell, entered and took him away, leaving his wife and three young children behind. They had mistaken Dr. Willi Schmidt, music critic for a Munich newspaper, for another Willi Schmidt on the list. Dr. Schmidt was assassinated and his body later returned to his family in a sealed coffin with orders from the Gestapo that it should not be opened. On July 13, Hitler gave a long speech to the Nazi controlled Reichstag (Parliament) in which he announced seventy four had been shot and justified the murders. "If anyone reproaches me and asks why I did not resort to the regular courts of justice, then all I can say is this: In this hour I was responsible for the fate of the German people, and thereby I became the supreme judge of the German people." "It was no secret that this time the revolution would have to be bloody; when we spoke of it we called it 'The Night of the Long Knives.' Everyone must know for all future time that if he raises his hand to strike the State, then certain death is his lot." By proclaiming himself the supreme judge of the German people, Hitler in effect placed himself above the law, making his word the law, and thus instilled a permanent sense of fear in the German people. The German Army generals, by condoning the unprecedented events of the Night of the Long Knives, effectively cast their lot with Hitler and began the long journey with him that would eventually lead them to the brink of world conquest and later to the hanging docks at Nuremberg after the war. A few weeks after the purge, Hitler rewarded the SS for its role by raising the SS to independent status as an organization no longer part of the SA. Leader of the SS, Reichsführer Heinrich Himmler now answered to Hitler and no one else. Reinhard Heydrich was promoted to SS Gruppenführer (Lieutenant-General). From this time on, the SA brownshirts would be diminished and all but disappear eventually as its members were inducted into the regular Army after Hitler re-introduced military conscription in 1935. The SS organization under Himmler and Heydrich would greatly expand and become Hitler's instrument of mass murder and terror throughout the remaining history of the Third Reich, another eleven years.